Efforts to rebuild the Victoria Islamic Center started within days of an arson attack in January 2017. 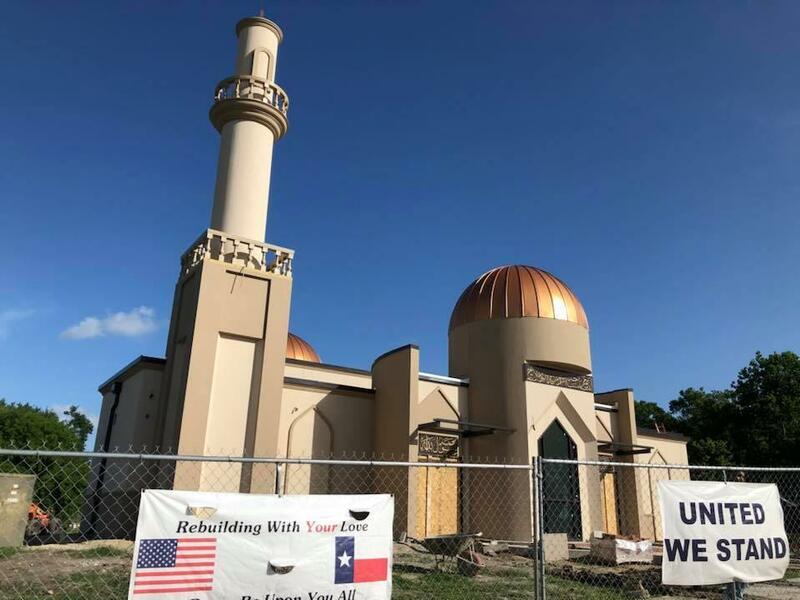 The Texas mosque is getting closer to being ready to hold services again. "Hate crimes are not only an attack on a specific victim, they threaten the cornerstone of diversity that America was built upon," FBI Special Agent in Charge Perrye K. Turner said of the case, according to a Justice Department release. "Perpetrators of hate crimes, like Perez, aim to chip away at our nation's foundations by instilling fear into entire communities with violence." More than $1.1 million was donated to help rebuild the mosque, with the bulk of that money coming just days after the blaze. The mosque's congregants were also embraced by the small Texas city, as the community held rallies and prayer vigils to reject hate. According to recent postings on its Facebook page, the mosque has been nearly rebuilt and the new facade around the main entrance includes granite display blocks from the original building. "Our hearts are filled with gratitude for the tremendous support we've received," wrote Omar Rachid, who attends the mosque, on the fundraising campaign's webpage. "The outpouring of love, kind words, hugs, helping hands and the financial contributions are examples of the true American Spirit and Humanity at its best with donations coming in from all over the world." Perez was found guilty of a federal hate crime for the destruction of a religious place of worship, along with using a fire to commit a felony and possession of an unregistered destructive device (in connection to an attempted car bombing two weeks before the arson). The jury took about three hours to deliberate before finding Perez guilty on all counts. During Perez's five-day trial, prosecutors presented a witness who was with him on the night of the fire. The Justice Department says that person "described how excited Perez was upon seeing the mosque in flames and that he was 'jumping up and down like a little kid.' "
The government said items that had been stolen from the mosque were found in Perez's home. And an agent said Perez's Facebook profile featured hate-filled postings. As Houston Public Media reports, the mosque attack came just after President Trump issued his first attempt at a travel ban that targeted several Muslim-majority countries. After the fire, HPM reports, "A member of the mosque took photos of the blaze and posted them to the center's official Facebook page, writing, 'We will rebuild, with LOVE!' "